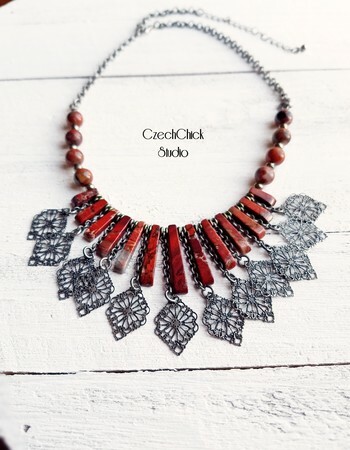 I wanted to design a statement necklace with the Red Creek Jasper set, so I decided to add some filigree pieces to accent the colors in the gemstones. It's a very lightweight necklace. The filigree pieces add so much interest to this necklace! And those jasper beads are gorgeous! Great work. Wowza! This is an outstanding work of art!! Great job Donna!! Wow! This is such a beautiful design. The chain and filigree send this to another dimension! Fantastic work! Altogether stunning and lovely! 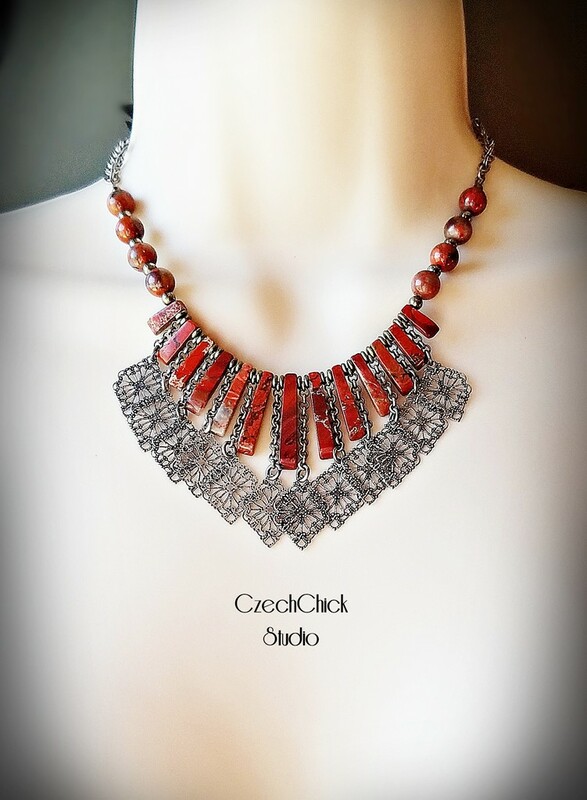 Those jasper beads are such a rich color, and work so nicely with the antique silver in this unique necklace. I also admire your photographic presentation of the piece. This is stunning. I love filigree & you used it in a very unique way. I just love your design. By the way, are you watching Victoria on PBS Sunday nights? We just discovered it & I am really enjoying it. The acting is superb. Thank you for all your nice comments! Yes, Moogie, I’ve been watching Victoria since the series started. Love it! I hope you will be able to see the other seasons, too. Beautiful statement necklace! Love the colors! WOW! Love the color of the red creek jasper and the filigree is an unexpected element. Great design! What a beautiful statement piece. The filigree takes it a new level. awesome job!